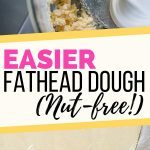 The best way to make Fathead dough easier and nut free! Whether you want to make Fathead pizza dough with coconut flour, or you’re just looking for an easier way to mix the dough, this version is for you. When fathead pizza was first made popular by the Fat Head movie’s blog, I made it a few times and it was delicious. But truthfully, the dough was a little unwieldy. The egg and almond flour seemed to take forever to combine with the melted mozzarella and cream cheese. 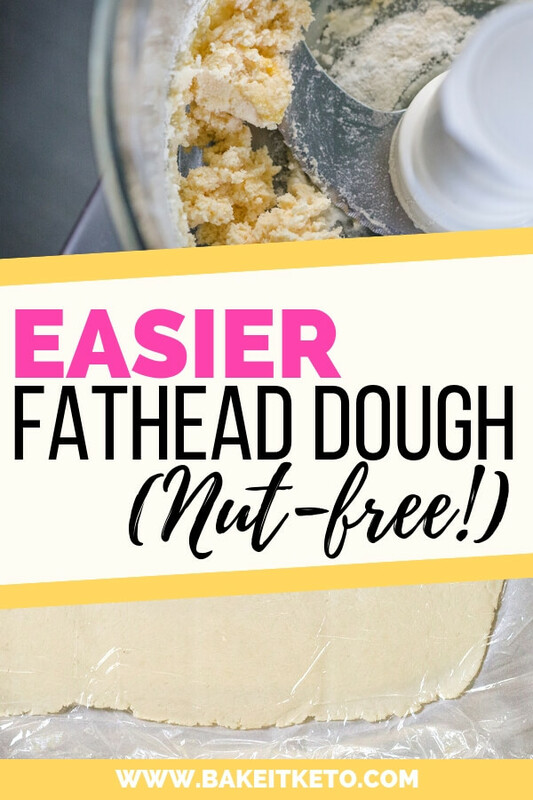 Today I’m sharing what I do to make fathead dough easier and nut free! 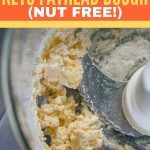 What Is Keto Fathead Dough? Tom Naughton’s 2009 documentary titled Fat Head challenged many ideas about nutrition. Many low carbers were first introduced to fathead dough by the Fat Head Movie’s blog post The Older Brother’s Oldest Son’s Faux Carb Pizza. After that, Fathead dough quickly became the darling of the keto world. Fathead dough is traditionally made by melting together shredded mozzarella and cream cheese, and then mixing in an egg and almond flour. With Fathead dough you can! Fathead dough pizza is one of the best ways to make low carb pizza. Just roll the dough out between parchment paper, or parchment paper and plastic wrap (around ⅛” to ¼” thick works well). I like to par-bake it at 400 degrees F for 8-10 minutes before adding the toppings. Fathead pizza is very rich and filling, so many low carb eaters find they are satisfied with only one or two pieces. How To Make Fathead Dough The Easier Way! I’m a huge fan of my Magimix food processor. If you’ve never heard of a Magimix, they’re made by the same company that makes the workhorse Robot Coupe food processors found in commercial restaurant kitchens. And they are seriously legit. I cannot recommend them highly enough. Today the Magimix is coming to the rescue and making Fathead dough SO much easier. 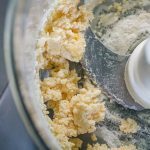 The first time I tried making fathead dough in a food processor, I was worried that the original mixing method I hated might have some benefit. I wondered if the stringy cheese and repeated folding (while I tried and failed to completely incorporate the egg and almond flour) were somehow acting similarly to gluten. All my fears were for nothing because the version made in the food processor was just as good. First, you will add all of the dry ingredients to the bowl of your food processor and pulse to combine them. Here we’re using coconut flour instead of almond flour (more on that below), salt, and a bit of baking powder to give it more lift. Next, gradually melt the shredded mozzarella and cubed cream cheese together in the microwave as usual. While the cheeses are melting, add the egg to the food processor and pulse to combine it with the dry ingredients. Lastly, use a rubber spatula to scrape the melted cheese mixture into the food processor, and pulse several times to bring the dough together. So much easier to mix! Why should those avoiding nuts miss out on the fathead dough fun?! I started avoiding almonds after a food sensitivity test revealed I have a strong sensitivity to them. I was very skeptical of the test results, but within a few weeks of removing almonds from my diet, a nagging autoimmune skin condition on my arm completely went away and never returned. So, for now, I remain almond-free. 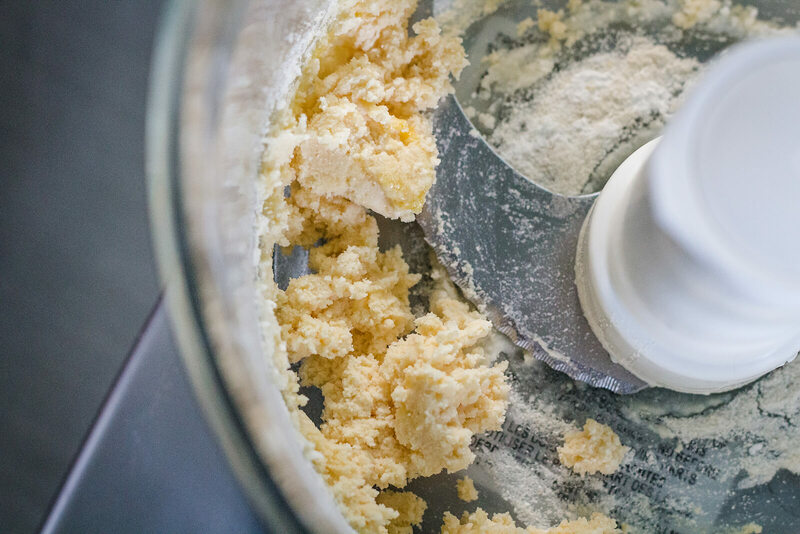 Substituting coconut flour for almond flour can be tricky, as it’s so much more absorbent (you usually only need about one quarter the amount of coconut flour). Luckily, the fathead dough comes together more easily when using coconut flour. Add the coconut flour, baking powder, and salt to the bowl of your food processor and pulse to combine. Scrape the Fathead dough out onto a sheet of parchment paper and form it into a ball. Cover with a sheet of plastic wrap (to avoid sticking) and roll the dough out into the required shape for your Fathead-based recipe. To make Fathead pizza, roll the dough out to 1/8"-1/4" thick (I like to make a large rectangle pizza on a cookie sheet). Par-bake at 400 degrees F for 8-10 minutes. Add the topping and continue baking until the toppings are the desired doneness. WANT TO SAVE THIS EASY COCONUT FLOUR FATHEAD DOUGH RECIPE FOR LATER? CLICK HERE TO PIN THIS RECIPE TO YOUR FAVORITE KETO PINTEREST BOARD!